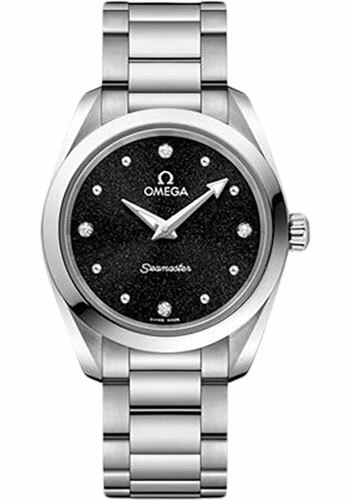 28 mm stainless steel case, domed scratch-resistant sapphire crystal anti-reflective treatment on both sides, shimmer black dial with 8 dotted rhodium-plated indexes and 4 diamond indexes in rhodium-plated holders, Omega 4061 quartz movement with long life feature to maximize the autonomy of the battery, stainless steel bracelet. Water resistant to 15 bar (150 metres / 500 feet). 28 mm stainless steel case, domed scratch-resistant sapphire crystal anti-reflective treatment on both sides, glossy ice blue dial with 8 dotted rhodium-plated indexes and 4 diamond indexes in rhodium-plated holders, Omega 4061 quartz movement with long life feature to maximize the autonomy of the battery, stainless steel bracelet. Water resistant to 15 bar (150 metres / 500 feet). 28 mm stainless steel case, domed scratch-resistant sapphire crystal anti-reflective treatment on both sides, shimmer white dial with 8 dotted indexes made from 18K Sedna™ gold and 4 diamond indexes in 18K Sedna™ gold holders, Omega 4061 quartz movement with long life feature to maximize the autonomy of the battery, stainless steel bracelet. Water resistant to 15 bar (150 metres / 500 feet). 28 mm stainless steel case, domed scratch-resistant sapphire crystal anti-reflective treatment on both sides, white pearled mother-of-pearl dial and 12 diamond indexes in rhodium-plated holders, Omega 4061 quartz movement with long life feature to maximize the autonomy of the battery, stainless steel bracelet. Water resistant to 15 bar (150 metres / 500 feet). 28 mm stainless steel case, domed scratch-resistant sapphire crystal anti-reflective treatment on both sides, glossy lilac dial with 8 dotted rhodium-plated indexes and 4 diamond indexes in rhodium-plated holders, Omega 4061 quartz movement with long life feature to maximize the autonomy of the battery, stainless steel bracelet. Water resistant to 15 bar (150 metres / 500 feet).